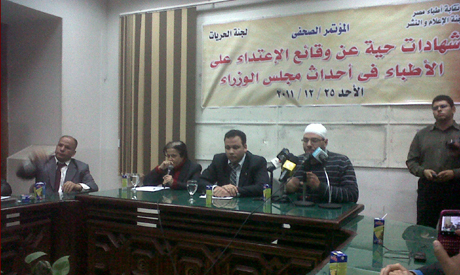 Doctors held a press conference at their syndicate on Sunday narrating stories of what they described as systematic targeting of physicians and Tahrir field hospitals during clashes between the military and protesters on Qasr El-Aini in December as well as Mohamed Mahmoud Street in November. Eyewitness physicians told reporters that one doctor was shot dead, another kidnapped, several arrested and tortured, and many injured during the military crackdown on protesters. Abd El-Hady is amongst the many field doctors of Tahrir who were targeted by the military during its attacks against demonstrators. He lost his life after he sustained a bullet to the chest. Videos circulated on social media sites show the fifth year medical student as he was being carried to an ambulance in the street leading to the Cabinet, where ongoing clashes left many demonstrators dead or injured. On the day of his funeral, around 2,000 fellow students at Ain Shams University marched protesting the military violence. Doctors said Abd El-Hady's death was no coincidence. “Doctors have been intentionally targeted during the attacks. When we were working in the Omar Makram field hospital military came trying to attack the mosque several times but luckily the door was too strong to open and needed to be knocked down. Thank God they did not go that far but the three field hospitals located in the tents centring the square were knocked down and their medical contents completely burned,” asserted Mina. Doctor Amr Salah recounted what happened after he headed to one of Tahrir’s field hospitals on receiving a message stating that doctors were needed during one of the five nights of clashes. He explained that as he was working at the field hospital near the scientific complex, stones were being thrown in the direction of the field hospital by military personnel standing on the complex’s rooftop. Although slightly injured, Salah continued with his work. Hours later when the military attacked protesters nearby in Tahrir Square and as he was transporting an injured protester to safety, he witnessed the attack of the Omar Makram Mosque field hospital. “When I said that it was my job to aid any patient, they started hitting me with batons. They hit me several times on my head. I needed six stitches on one part of my head, and two stitches on another part. Despite the excessive bleeding, I did not enter an ambulance, fearing where it would transport me to,” added Salah. Testimonies like that of Salah were told by five different doctors at the press conference. Doctor Karim Mohamed Abd El-Halim narrated that he was taken in by the military while working in the Mohamed Mahmoud field hospital back in November and detained in the parliament headquarters. Abd El-Halim explains, “the word doctor seemed to provoke them. They told me you are the one responsible for aiding these people and started beating me. They tied my hands together with rope, splashed water all over my body and forced me to drink water mixed with mud. They went on torturing me for five consecutive hours, and they were all high ranked military officials”. All the doctors’ testimonies recounted violence like this. One doctor, however, insisted that what they suffered was nothing in comparison to what other physicians have given up. Several doctors at the conference praised Doctor Ahmed Harara who lost one of his eyes during the violent police attacks on 28 January and his other eye during police attacks on 19 November. He has now lost the sight of both eyes. Alaa Abd El-Hady the young doctor who lost his life was also highly commemorated by the doctors who realised they could have met a similar fate. Doctors did not only suffer from military violence on the field but were also tracked down afterwards, according to various testimonies. Doctor Ahmed Hussein, the physician responsible for documenting the numbers of injuries and deaths resulting from the clashes, was kidnapped and tortured. Another doctor said several physicians have received phone calls threatening that their families will be targeted if they do not stop aiding demonstrators. The Doctors Syndicate is looking into taking these violations to court. According to Mina, efforts to halt such violations do not only aim at guaranteeing the safety of individual physicians, but at protecting medicine as a profession as it cannot function if doctors are not able to aid their patients without state interference. Doctors at the conference said they will hold a demonstration wearing their white coats to protest violations they faced at the hands of security forces on a date yet to be comfirmed.